Heat advisory, air quality alert in effect today – Welcome to Wyandotte Daily! 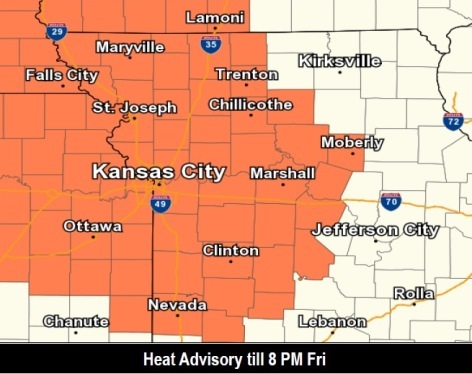 A heat advisory is in effect for Wyandotte County until 8 p.m. Friday, July 13, according to the National Weather Service. An orange ozone air quality alert also is in effect today, according to the Mid-America Regional Council. Today will be sunny and hot, with a high near 97 and a heat index as high as 101, the weather service said. The heat wave continues until Friday, and temperatures at night will only fall to the mid to upper 70s, providing little relief from the daytime heat, the weather service said. 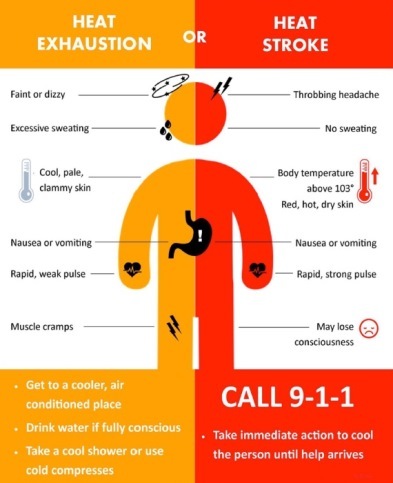 Residents are advised to stay in air-conditioned rooms as much as possible, reschedule strenuous outdoor activities to morning and night, check on elderly relatives, and be aware of the signs of heat illnesses, according to the weather service. During an air quality alert today, residents are asked to drive less, and use carpools, public transportation, bike or walk to work. They should avoid putting gasoline in vehicles today, avoid idling vehicles, and combine errands if they have to go out, according to MARC. RideKC bus prices are half-price today, at 75 cents a ride. Today, according to the weather service, the high will be near 97 with a heat index as high as 101, and a calm wind becoming south southeast 5 to 9 mph in the afternoon. Tonight, it will be mostly clear, with a low of 77 and a south southeast wind of 5 to 8 mph, according to the weather service. 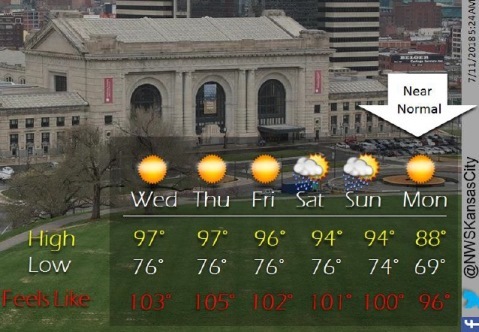 Thursday, it will be sunny and hot with a high near 98, the weather service said. The heat index will be as high as 104, with a south southeast wind of 5 to 7 mph. Thursday night, it will be mostly clear with a low of 77 and a south southeast wind of 5 to 8 mph, according to the weather service. Friday, it will be mostly sunny, with a high near 96 and a south wind of 5 to 7 mph, the weather service said. Friday night, skies will be partly cloudy with a low of 77, according to the weather service. Saturday, expect mostly sunny skies and a high of 95, the weather service said. Saturday night, it will be partly cloudy with a low of 77, according to the weather service. Sunday, there is a 30 percent chance of thunderstorms and rain after 1 p.m., with a high near 95, the weather service said. Sunday night, there is a 40 percent chance of showers and thunderstorms, with a low of 75, according to the weather service. Monday night, the low will be around 72, according to the weather service. Tuesday, there is a 30 percent chance of showers and thunderstorms, with a high near 88, the weather service said.